It’s August. In the hockey world, it’s a good time to look back. Next month, as teams hit training camp, it’ll be time to look forward. When it comes to gut-wrenching moments, the moments that really hit me the hardest in San Jose Sharks team history, they fall into two categories. Playoff failures and player injuries. I’m not going to include player injuries in this, perhaps that is a subject for another day. The Sharks have played 24 seasons and have won 24 playoff series in 18 postseason appearances. Pretty impressive, especially considering they missed the postseason in four of their initial six seasons. But of course, the Sharks have yet to win a Stanley Cup. A lot had to go right for a team with 18 playoff appearances and 24 series wins. But also some things had to go very wrong at key moments to keep this team from accomplishing even more. I’ll start with two honorable mentions. Each happened midway through a series. In the 2007 playoffs, the Sharks held a 2-1 series lead and 2-1 lead on the scoreboard against the Red Wings in game 4. With half a minute to go, Robert Lang of the Red Wings tied the game. Detroit won the game in overtime to tie the series. The Wings then won the next two games along with the series, holding the Sharks to just one goal over the final 120 minutes. The second honorable mention was a triple overtime game against Edmonton in 2006. Up 2-0 in the series and with the game in overtime, the Sharks had a great chance at a 3-0 series lead. Joe Thornton made a terrific cross-ice feed to Jonathan Cheechoo, but Dwayne Roloson came up with a gem of a save. After losing in triple OT, the Sharks couldn’t find their game again. Edmonton would win the next three, outscoring the Sharks 14-6 in those games, to close out the series. The Sharks had already upset the heavily favored Detroit Red Wings in Rd. 1 with a shocking win in 7 games. The Sharks, who had managed only 11 wins the prior season, were on the cusp of the conference finals in their second round series against the Maple Leafs. In Toronto, they led the series, 3-2. Game 6 went into overtime. Sharks winger Sergei Makarov would win a puck battle along the boards and find fellow winger Johan Garpenlov open in the slot with a crisp pass. Garpenlov has the series on his stick. He had time to take a quick wind-up. His slap shot beat goalie Felix Potvin, only to hit the post. The Sharks night would end shortly after that, when Mike Gartner would bank in bad angle goal of off goalie Arturs Irbe to force a game 7. The Sharks would ultimately lose game 7 and the series. Game 6 of the 2002 Western Conference semifinals between San Jose and the Colorado Avalanche took place in San Jose. The Shark Tank was rocking that night. Figuratively and literally. An earthquake centered in nearby Gilroy was felt inside the Tank during the 3rd period with the game tied at 1-1. Play never stopped. The Avs won that game in overtime on a Peter Forsberg goal, 2-1, to force a game 7. In game 7, the Sharks Teemu Selanne had a chance to score an easy one against one of the best big game goalies in history. Unlike most of the other moments on this list, the opportunity came early in the game, not late. Still, this was a good Sharks team. It had been a high scoring series, with the teams combining for eight or more goals in four of the first six games. About five minutes into the game, legendary goalie Patrick Roy misplayed a puck, leaving an open net for an easy wrap around score for Selanne. Alas, the future Hall of Famer simply missed. From that point on, Roy shut the door. In the 2nd period, it would be Forsberg who put Colorado ahead 1-0. That goal was the game’s only score and the series went to the Avs, four games to three. The Sharks had reason to be confident entering their second round series against the Stars. The Sharks had finished the regular season with 108 points, well ahead of the Stars 97. But three games into the series, the Sharks had failed to win a game. Two of the three losses came in overtime. However, a win in Dallas and an overtime win in San Jose two days later put the unthinkable within reach. Shark fans left the arena that night buzzing, the streets filled with cheers, optimism and plenty of teal. Now down just 3-2 in the series, a win would bring a game 7 to the Shark Tank. That game 7 never happened. It all came to a crushing end in Dallas. Game 6 steadily turned into a goalie showdown between Evgeni Nabakov and Marty Turco. Both goalies were brilliant. As the game went deep into the night, they only seemed to get better. In the fourth overtime, the Sharks were called for an icing. Head coach Ron Wilson chose not to use his time out. The Stars won the face-off and immediately thereafter drew a tripping penalty on Brian Campbell. About a minute later, with the man advantage, the Stars ended the Sharks season. Pivotal game 4 in the Western Conference finals took place on a warm spring afternoon in San Jose. After losing the first two series games in Vancouver, the Sharks played a strong game three to make the series 2-1. The Sharks were looking good again in game four and were dominating play. Until two disastrous minutes. The worst two minutes in team history. The problems started benignly enough. 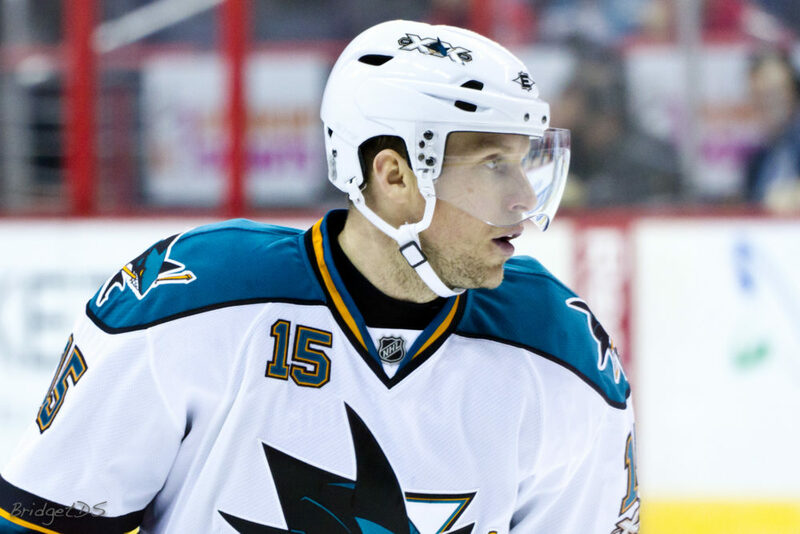 The game was scoreless when Dany Heatley was called for a high-sticking penalty. The Sharks were a good penalty killing team. At least when only one man down. 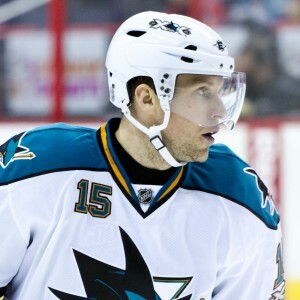 Shortly after Heatley’s penalty, Torrey Mitchell put the Sharks down two men with a ‘no doubt about it’ hooking penalty. Going down two players against the Sedins would prove lethal. It was tic-tac-toe hockey. Ryan Kesler knocked in the first Canucks goal. Heatley left the box, but the Sharks remained a man down. The Sharks would not get through the penalty kill before being called for too many men. It was a highly questionable call, the sort officials routinely let go, even in the regular season. It boiled down to this: Patrick Marleau, standing on the ice by the bench and uninvolved in the play was waiting for the door to open instead of going over the boards to get to the bench. A ‘swallow the whistle’ moment if there ever was. But not that fateful day. Down two men for a 2nd time, the Sedins made the Sharks pay a 2nd time. It would be only moments after giving up the 2nd goal when Douglas Murray attempted to clear a bouncing puck from inside his own blue line. The puck popped up in the air and went over the glass for a delay of game penalty. What quickly followed was a third 5-on-3 goal, all three goals in a time span of less than 2 minutes, essentially sealing the game. The Sedins tallied 5 assists in those two minutes. Sharks goalie Antti Niemi had no chance against the close-in snipes. Vancouver won that game 4-2, despite being outshot by 35-13. Vancouver would win the series in gut-wrenching fashion as well. In game 5, Vancouver would tie the game with less than half a minute to play. In double overtime, a rim attempt by Vancouver hit a stanchion, most of the players lost sight of the puck thinking it had gone up into the netting. But it didn’t. The odd ricochet fell right at the feet of the Canucks Kevin Bieksa. His weak shot from just inside the blue line wouldn’t make it past a goalie who knew where the puck was. But Antti Niemi, along with most everyone else on the ice other than Bieksa, had lost site of the puck. It was in the net before most players realized what had happened. Hockey happens, in that series, it was particularly cruel to the Sharks. Five minutes to go, game 7 in the 2013 Western Conference semifinals. The Sharks trailing by 1 goal. LA Kings goalie Jonathan Quick was down on the ice after stopping a Marc-Edouard Vlasic shot with Pavelski screening in front. It left Pavelski, perhaps the best clutch goal scorer in Sharks history, digging for the rebound. The puck momentarily gets a few inches past Pavelski, but he recovers and sends the puck towards the net. But the extra moment to recover the puck proves fatal. Rob Scuderi gets his stick just far enough into the shooting lane to prevent Pavelski from lifting the puck. Instead the puck skitters along the ice into the glove of the fallen goalie. Five minutes later, it was time for handshakes, as Quick and the Kings advanced, sending the Sharks home. The Sharks playoff collapse versus the Kings in 2014 was simply brutal. Leading the series 3-0, the Sharks lost the next four to make unwanted history. Yes, it was gut-wrenching. No single play made a bigger difference than the controversial goal the Kings scored late in game 6 to take a 2-1 lead. With eight minutes to go and the score tied, the Kings Robin Regehr fired a shot towards the net which appears to get saved by goalie Alex Stalock. Justin Williams, in front of the net, looks for the puck, which is under the Stalock. Williams clearly pushes Stalock, the puck comes loose behind Stalock and crosses the goal line (for those who like to read lips, the clip below appears to catch Williams telling teammate Anze Kopitar “I pushed the goalie into the net”). The Sharks, who had been outplayed since the end of game 3 desparately needed some puck luck. Instead, the call went to the Kings. In short order, the Kings added two more goals for a 4-1 win over the shell-shocked Sharks. The Sharks season ended two days later in San Jose, while the Kings would continue on and a few weeks later, hoist another Stanley Cup.